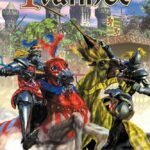 Alan Moon has found a great deal of success in revisiting games, giving them a twist , and making them his own. Inspired by Sid Sackson’s Acquire, Moon came up with Airlines which he then again reworked into Union Pacific. Wolfgang (and Ursula) Kramer’s Wildlife Adventureserved to inspire Moon’s Santa Fe. He reworked his own Elfenroads to emerge with Game of the Year winner Elfenland. You can’t argue with success. 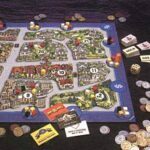 This time around, Moon, teaming up with Aaron Weissblum, tweak El Grande, the great game by Wolfgang Kramer and Richard Ulrich, and come up with San Marco, a more accessible El Grande with enough originality to make it worthy of a spot on your game shelf. San Marco centers on power politics in Venice… Three to four players represent powerful families vying for a seat on the city’s council. Gain the highest esteem and you win the game. The game comes boxed with a mounted game board of Venice divided into six districts and high quality components including 100 aristocrats (wooden cubes divided equally into four colors), prestige stones (used as markers), 12 bridges, 62 Action cards, 28 Limit cards, a Doge piece and a die. The clear and concise rulebook contains rules in five languages including English. This is a game of low to moderate complexity with a playing time of about an hour. San Marco is played in three passages or turns. Each passage consists of a variable number of rounds. The player who being each round…takes each player’s prestige stone and randomly draws them one at a time. This determines the players who will be the “distributors” and those who will be the “decision-makers”. The two distributors each draw 5 Action and 3 Limit cards. Separately and secretly, each distributor then divides the cards into two piles. Then, the first distributor exposes both piles and it is up to the first decision-maker to decide while pile to take. This is a variation of you cutting the cake and having your guest take the first piece! (This procedure is then repeated with the remaining two players.) This division of cards is the key to the game. Action Cards allow players to do certain things. A district card allows the placement of an aristocrat in the named district (and then, if so desired, allows the aristocrat to move to one neighboring district if linked by a bridge). A bridge card allows a player to place a bridge between two districts. A transfer card replaces an enemy aristocrat in any district with one of yours while banishment removes a die roll’s worth of aristocrats from any named district. The Doge card causes scoring to occur in any area that the Doge piece is placed. The Limit Cards, however, force you to pay a penalty. Limit cards come in denominations of 1, 2 and 3. If a player amasses a total of 10 or more limit points, than that passage is over for him! Each district shows two values. These values indicate the number of prestige points won by the player with the most and second most amount of aristocrats in the area when the Doge is present. The Doge may enter (or remain in a district if he starts the turn there) upon play of the Doge card. If remaining in the district, that district is scored. If the player decides to move the Doge, the Doge piece may cross over bridges owned by that player for free. Otherwise, crossing a bridge owned by an opponent earns one prestige point for the bridge owner. A Doge may also “skip” over to a district not connected by a bridge. However, this costs the player two prestige points. This ability to “skip” cuts two ways. In the beginning of the game, “skipping” help players without bridges in strategic places to score since bridge “networks” have not really been built yet. On the other hand, “skipping” certainly makes the game more “forgiving”; you can still score even if you have painted yourself into a corner. In aiming for a general, “family game”, audience, you can understand the purpose of “skipping”. From a gamer point of view, however, it minimizes the worth of the bridges (which unbalances card values) and devalues the rewards for careful planning. A passage approaches its end when one or more players reach or exceed 10 limit points. Upon reaching or exceeding 10, a player may finish playing his action cards but then he is finished for this segment of play. If, at this point, two or three players have less than 10, one more round is played and then, the passage is over… At this point, the limit points of all players are compared. Anyone with less than 10 receives bonus points equal t the highest held total of limit points minus that player’s points. (If Player A, for example, went out with 15 limit points and player B finished with 9, player B earns a bonus of 6 prestige points.) Finally, the player with the fewest limit points is allowed to perform a “banishment” as if he had another banishment action card. With the completion of the third passage, every district in the game is scored. The player with the highest total of prestige points wins! 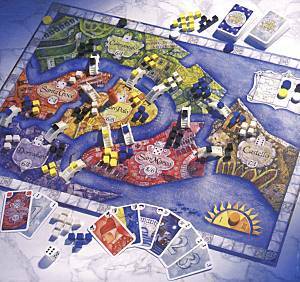 Like El Grande, nobles are moved from their holdings onto different provinces or districts. Scoring is done at the location of the king (doge). All areas get scored in the end with the most influence gaining the most prestige/points. But in San Marco, these actions are streamlined. Plus the King Solomon-esque division of the cards force players to search for the elusive “Threshold of Pain”, the point at which you tempt your opponent to take cards – and the highest penalty you can inflict upon him – without making the penalty so severe that he passes them by and YOU are left with them!